← Sometimes you just have to walk away. Exquisite!!!! Both the lace, and the way you’ve chosen to treat it. This promises to be stunning – definitely a full puff of skirt! Do you know what you’re going to use yet? No, I haven’t got that far yet… I must admit I have some other things I need to clear off my plate first, /sigh. That’s so interesting, taking a piece that already has a history and adding a new chapter to it! The lace is so delicate, I wish I could do that and it would take no time at all LOL! I like the shape you gave to the top- the pic is awesome! I know! I have so little patience for needlepoint! I feel so lucky to get a piece like this to incorporate. What a pretty top ! Thats lovely- I’m sure the fabric is very happy to finally be used to it’s best advantage! Your instincts are right… I think it’s hand hem-stitching which is an heirloom technique, but the little spiderweb panels are her way of showing off a little maybe. Lovely top! And it’s a great thrift store story. Someone has obviously spent a lot of time making the beautiful lace and yet it has ended up not used and finally been consigned to the thrift shop, which if the fabric ended there would be a bit sad. However, you have discovered it, appreciated it and now it is going to be worn and is on your blog so lots of people are seeing the work that the mystery lacemaker did. How nice is that. Yeah, I think this is kinda what we all hope for when we give our old or unused things to a thrift store—that someone else will find and cherish and use it fully. Wonderful! Really like it! A great use of that lace piece. I totally thought “inset for a top” when I saw that lace. I probably would have made a tunic but I think your treatment is better — more modern and unique! I do find myself hoping that someone rehomes the stuff I take to the thrift. That’s a lucky thrift score! Did you date the lace at all? My first thought is late 60s-70s because that was the last time that kind of work was popular, but it could be even earlier. I saw lace making in Brugge, Belgium. It looks haaaaard. The lace looks like an illustration of ‘drawn-thread lace’ in one of my books (The Art of Lacemaking, by Ann Collier). 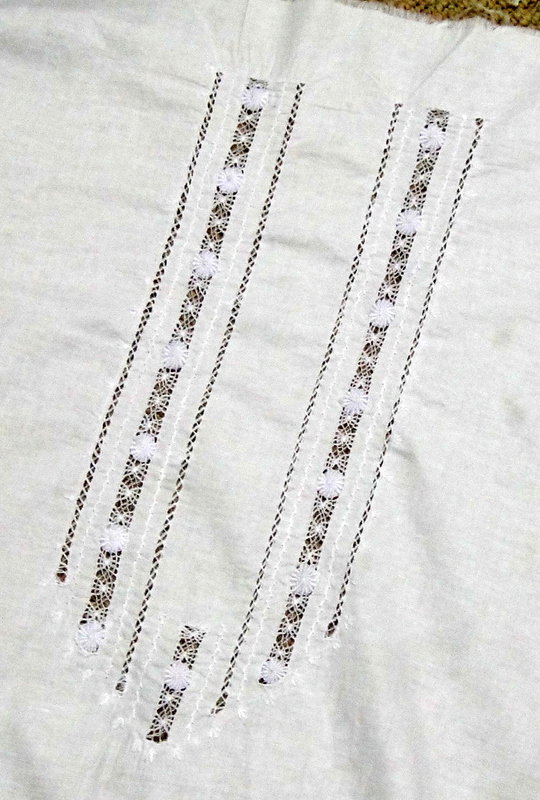 The technique involves pulling out some of the threads (in this case, langth-wise) and using a needle and thread to create the pattern by stitching, perhaps like a buttonhole stitch, over groups of the remaining threads. This is not something I have ever had the patience to even try, and I can’t imagine doing it on a finely woven fabric! It is truly lovely, and I am so glad you used it as you did, as really showcases it. What a great use of a beautiful and unique piece of fabric! Tanit Isis strikes again. Totally adorable – perfect fabric and top to showcase the pretty lace. Yes I can imagine the look with a girlie skirt I love the Jean shorts look. You look gorgeous! Thank you for your sage piping advice. I certainly plan to trial it soon. I knew you’d know- you are the queen of piping!! Thank you for your comment! Hmmm, old; check. Wears purple; check, so I guess I fit the bill! Actually the quilt you mentioned is not odd or unusual at all, but a well-recognised type of quilting called Marseilles quilting. You have to really looove hand-quilting, way more than I do, to have a go at those ones! This top is completely adorable, and that lovely embroidery was screaming out to be showcased in a pretty garment like this. I think you’ve styled it perfectly with the little denim shorts! Oh, pretty! Although if I were making for myself then I’d get those straps on pronto. That drawn thread work looks so amazing – it’s great you’ve been able to turn it into a cute-as top!